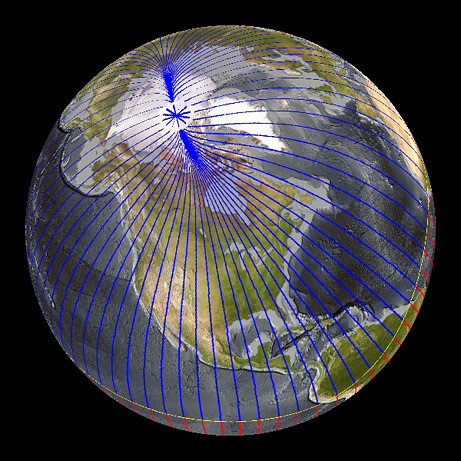 New research shows the pole moving at rapid clip—25 miles (40 kilometers) a year. Over the past century the pole has moved 685 miles (1,100 kilometers) from Arctic Canada toward Siberia, says Joe Stoner, a paleomagnetist at Oregon State University. Earth’s north magnetic pole is racing toward Russia at almost 40 miles (64 kilometers) a year due to magnetic changes in the planet’s core, new research says. The core is too deep for scientists to directly detect its magnetic field. But researchers can infer the field’s movements by tracking how Earth’s magnetic field has been changing at the surface and in space. Now, newly analyzed data suggest that there’s a region of rapidly changing magnetism on the core’s surface, possibly being created by a mysterious “plume” of magnetism arising from deeper in the core. And it’s this region that could be pulling the magnetic pole away from its long-time location in northern Canada, said Arnaud Chulliat, a geophysicist at the Institut de Physique du Globe de Paris in France. Magnetic north, which is the place where compass needles actually point, is near but not exactly in the same place as the geographic North Pole. Right now, magnetic north is close to Canada’s Ellesmere Island. Navigators have used magnetic north for centuries to orient themselves when they’re far from recognizable landmarks. Although global positioning systems have largely replaced such traditional techniques, many people still find compasses useful for getting around underwater and underground where GPS satellites can’t communicate. The magnetic north pole had moved little from the time scientists first located it in 1831. Then in 1904, the pole began shifting northeastward at a steady pace of about 9 miles (15 kilometers) a year. In 1989 it sped up again, and in 2007 scientists confirmed that the pole is now galloping toward Siberia at 34 to 37 miles (55 to 60 kilometers) a year. Geologists think Earth has a magnetic field because the core is made up of a solid iron center surrounded by rapidly spinning liquid rock. This creates a “dynamo” that drives our magnetic field. Scientists had long suspected that, since the molten core is constantly moving, changes in its magnetism might be affecting the surface location of magnetic north. Although the new research seems to back up this idea, Chulliat is not ready to say whether magnetic north will eventually cross into Russia. “It’s too difficult to forecast,” Chulliat said. Also, nobody knows when another change in the core might pop up elsewhere, sending magnetic north wandering in a new direction. Chulliat presented his work this week at a meeting of the American Geophysical Union in San Francisco.